At this time of year there’s really no excuse for gardens to be boring! Surprisingly though, it seems to be a common problem when I go to visit new clients. There are so many great plants out there doing their stuff in autumn, that it’s just a question of planning ahead, maybe not being obsessed by summer flowers, and putting in a range of plants which will add late colour to the garden until the first frosts and beyond. 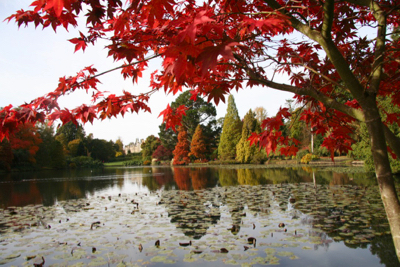 One of the most spectacular plants for autumn colour is undoubtedly the Japanese Maple (Acer palmatum). There are so many varieties to choose from, varying in size, foliage colour (from green through to very dark red) and foliage shape. Some Acers will (eventually) reach a fairly large size, but many stay small and shrub-like. 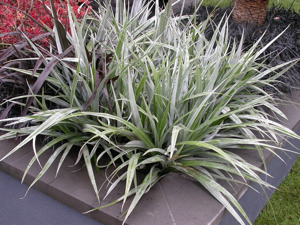 They’re also great plants to keep in pots, and not that hard to grow – as long as they have adequate moisture (but good drainage) and preferably some shade. 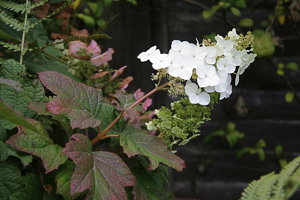 One of my all-time favourite shrubs, and one which is particularly lovely in autumn is the oak-leaved Hydrangea (Hydrangea quercifolia). I grow it under an apple tree where it really thrives despite the fairly dry conditions, and it has reached a much bigger size than it says in the books! It’s now at least 2 metres wide and almost the same in height, and I wouldn’t be without it. In late summer the lovely large leaves start to turn a deep purple colour and the creamy white flowers fade to shades of pink as autumn progresses. 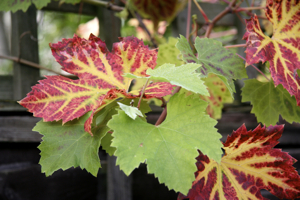 A great climber with spectacular colour at this time of year is the vine, Vitis ‘Brandt’. I have eaten grapes from mine, but you really need a good summer for them to be worth eating. For me it’s all about the leaf colour in autumn. I grow it over quite a large pergola and even though it gets pruned back pretty well every year it heads upwards and into neighbouring trees, which is okay in my own garden, but you should be prepared for vigorous growth (up to 8 metres or so in height) so make sure you provide enough space and support. Ornamental grasses really come into their own from September onwards and I particularly like the Miscanthus family as they are grasses which stand so well through winter. They are really robust grasses, aren’t particularly fussy about where they are planted, and give great value for at least 9 months of the year. 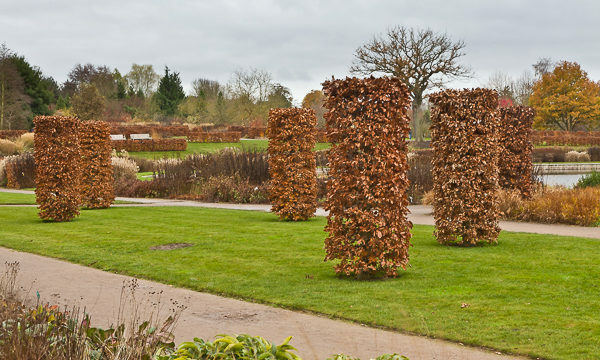 I particularly like Miscanthus ‘Malepartus’ (which is a bit of a giant at 2m+ in height), as it has beautiful wine-red flowers which fade to white and last well through the winter. Dahlias of course are invaluable to add late colour to the garden – and to grow as cut flowers. Depending on where you live and how harsh your winters are, you may need to dig up the tubers and store them over winter. I keep mine in the ground and they’ve survived well despite the very difficult conditions we’ve had over the last few winters. One of my favourite Dahlias is ‘David Howard’ with lovely big orange flowers which contrast beautifully with its dark foliage. The range of Dahlias is enormous, and even though they’re often perceived as old-fashioned flowers, I think they’re fantastic! Sedum (commonly known as the Ice plant) are another great plant for this time of year. 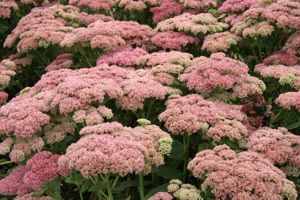 One of the easiest perennials to grow in dry sunny spots, they form clumps of fleshy foliage and as the summer progresses the flower heads of the pink varieties change colour. It seems like new varieties of Sedum are constantly being introduced, some of which have very dark foliage and flowers (‘Vera Jameson’, ‘Purple Emperor’) and which work really well to add contrast to a mixed border. There are also a number of small trailing varieties (‘Bertram Anderson’, ‘Ruby Glow’) which are great for raised beds or to use as edging plants). 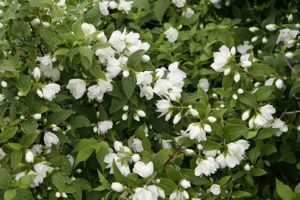 A number of white flowering varieties (‘Iceberg’ for example) are worth growing too. 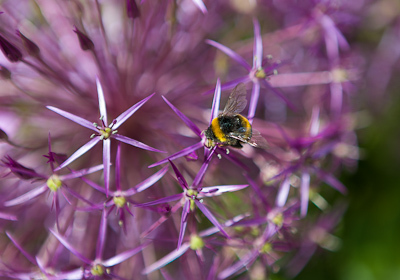 Not only rabbit-resistant, but also attractive to bees and butterflies, Sedum are definitely worth considering in any sunny spot. For something a bit more exotic, you could try the Kaffir lily, Schizostylis – a South African native which flowers in autumn. Schizostylis coccinea ‘Major’ is probably the best known variety and it has lovely red flowers and long sword-like leaves. Possibly not the easiest plant to grow in the UK as it likes a fair amount of moisture and good rich soil in summer but cold dry winters. Still, it’s always good to have a challenge! 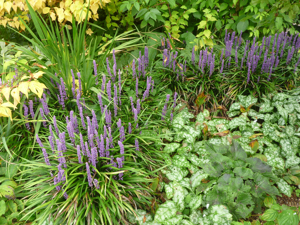 A very useful plant which I use a lot in my planting design is the lily turf Liriope muscari. A small evergreen ground cover plant which is happy in dry shade as well as sun, it has lovely spires of purple flowers in autumn. 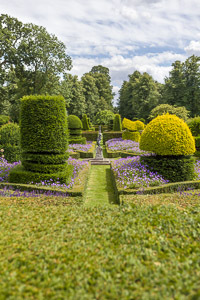 The foliage is valuable in its own right as it forms dense clumps of arching leathery green leaves, making it perfect as an edging plant or to grow underneath deciduous shrubs. 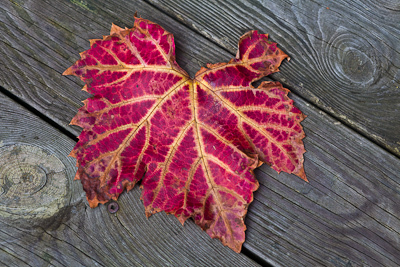 Just a few ideas to add colour to the autumn garden and to illustrate that it’s not just about leaf colour – there’s a vast array of fantastic plants out there to enhance your outdoor space at this time of year.